Our Banner Stands are extremely versatile display stands and are the quickest and easiest way to make a promotional presence at exhibitions, trade shows, retail display and events. The banner stands have been developed with you the end user in mind. They are lightweight, robust, fast and simple to set up and take down. The banner graphics are easily interchangeable or replaceable so once you buy the stand you only need to replace the banner graphic as and when you require a new image. All the display banner stands compact down to relatively small sizes and each has it's own carry case which makes them easily portable. 01.) Roll Up (Retractable) Banner Stand RBS24060SX15. Great quality at an affordable price makes the Roll Up Classic retractable banner stand an oustanding value. Our aluminum based retractable floor standing banners are very lightweight, sturdy and professional looking.Optional spotlights are available to illuminate your messages. 02.) Roll Up (Retractable) Banner Stand Double-Side RBS24060DX16. Double-Sided Roll Up is a new take on an great idea, why have one image per display when you can have two. Offering an image on both sides by using two banners instead of one this stand can capture the attention of oncoming traffic from multiple directions. 03.) 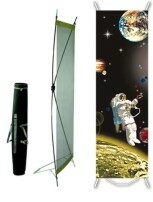 X- Banner Stand XBS24060X17. Our X-Spider standing banners are an ideal solution for great portability and easy set up of any eye-catching banner. Our metal extra stable X-Spider stands has an aluminum frame with extra built in stabilizing metal support base that easily sets up in a couple of minutes. The banners include a carrying bag with shoulder strap and an optional spotlight can be added to create better visibility. 04.) L- Banner Stand LBS24060X18. Create a simple attention grabbing display banner with our aluminum L-stand floor displays with included custom high resolution full colour printed graphics from artwork provided by you. The L-stand banners are ideal for trade shows, events, and retail promotions, as they are very lightweight and easily set up in a couple of minutes. An optional spotlight can also be added to create greater visibility, and our displays include a carrying bag. 05.) Pop up Display PUPDGENX19. 06A.) Wall Banner/Picture Shelf WBSH24060X19A. 07.) 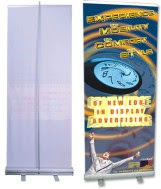 Mini Roll Up ( Retractable) Banner Stand MRBS08012X20. A small mini-size of Super-Roll Up Banner Stand suitable for Desktop/Counter/Tabletop use. 08.) Mini X- Banner Stand MXBS10015X21. A small mini-size of X- Banner Stand suitable for Desktop/Counter/Tabletop use. 09.) Mini L- Banner Stand MLBS08012X22. A small mini-size of L- Banner Stand suitable for Desktop/Counter/Tabletop use. 10.) Flying (Teardrop) Banner Stand FBS60030X23. Flying teardrop shape Banner Stand attracts more attention, revolving function withstands strong winds and large size shows more graphics suitable for both outdoor and indoor use. May that be inside or outside of an shopping mall, airport, amusement park, theater, stadium, exhibition/conference center, bank or any lobby where crowd management is involved, We offer high quality Q-maker that include the traditional post and rope.